Casey Lynne Garner as Wendy, Bob Harris as Gigi, Sam Hayder as Peter Pan and Derek Cooper as Aroel. Photo provided by Pumpkin Theatre. The Pumpkin Theatre hits the high seas and raises the Jolly Roger for the last show of their “Discovering New Friendships Through Familiar Tales” season. 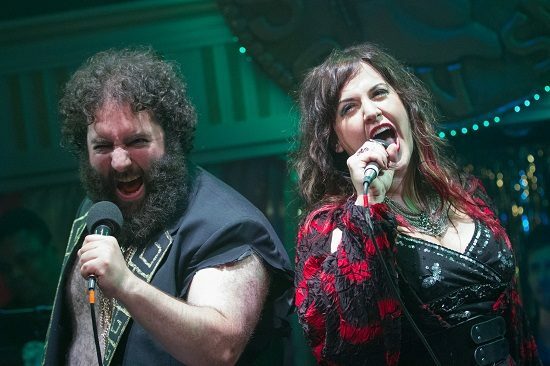 A musical version of Peter Pan & Wendy, written by Alyn Cardarelli and Steve Goers and directed by Stacy Needle, sails in with witty songs, interactive dialog and enthusiastic, talented actors. The J.M. Barrie classic story of Peter Pan’s adventures with Wendy, Tinker Bell, The Lost Boys, pirates and the infamous Capitan Hook remains basically the same. Peter “rescues” Wendy from a life in which she is being forced to grow up by her parents insisting she move out of her nursery bedroom and move to a “proper” adult room. Peter Pan, the boy who never grows up, whisks Wendy away to Neverland, where the residents see nothing wrong with living a life of fun and relish in having no responsibilities. Pumpkin Theatre’s production of ‘Peter Pan and Wendy’ has no problem capturing the excitement, charm and magic of the original story. Casey Garner as Wendy has a wonderful voice that is child-like but strong and clear. She is very engaging and easily kept the audience, which was overflowing with children, entertained and happy. Eric Poch as Captain Hook and Anthony Scimonelli as Captain Hook’s first mate Smee stole the show with the catchy song, “A Pirate Needs a Plan.” Poch’s Captain Hook is a bumbling, gentle giant who had the children clapping and laughing whenever he took to the stage. 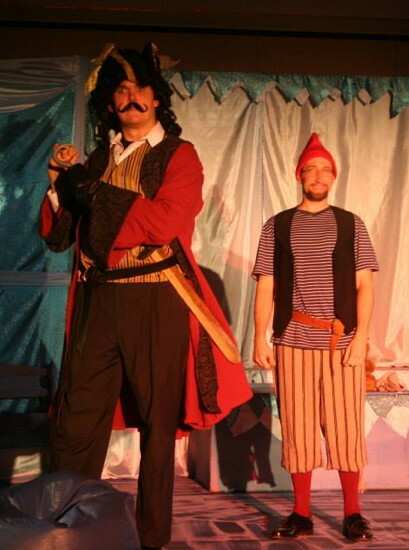 Eric Poch as Captain Hook and Anthony Scimonelli as Smee. Photo provided by Pumpkin Theatre. My personal favorite part of the show was Derek Cooper and Robert Harris playing Ariel and Gigi, two mermaids visited by Wendy and Peter. Cooper and Harris are hysterical as their high mermaid voices occasionally dip down to the lower registers and they slip in and out of “proper” mermaid behavior. Erin Confair as Tiger Lily and Mrs. Darling, is, as always, wonderful in her duel role, and Sam Hayder as Peter Pan joined in on the fun and excitement and gave a performance that deserved the clapping encouragement from the children in the audience. The creative set, designed by Ryan Michael Haase, looks like a young child’s nursery, but as the story progress, the nursery curtains turned into a waterfall flowing behind the mermaids, and a ship’s wheel mounted on the wall became Captain Hook’s ships wheel when sailing his pirate ship in search of Peter Pan. Overall, Cardarelli and Steve Goers put together a terrific, abbreviated version of a beloved classic fairytale, filled with short, likeable songs and appealing characters. Pumpkin Theatre’s production of Peter Pan and Wendy has no problem capturing the excitement, charm and magic of the original story. 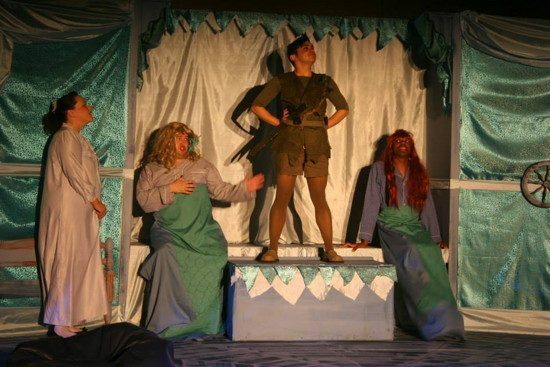 Peter Pan & Wendy is running through May 18, 2014 at Pumpkin Theatre, 2905 Walnut Avenue, Owings Mills, MD 21117. For tickets call 410-902-1814 or click here.